On 17 November 1998, late Professor Edward Said held a special meeting with students, the future of any nation, at Birzeit University. In a wide-ranging discussion, topics ranged from the current political situation in Palestine to the changing nature of society globally. "We should never ignore Israeli society but unfortunately it is virtually unknown to Arab society especially the Palestinian. I know for a fact that there is no single institution in Palestine that is dedicated to studying Israeli society. On the other hand, consider how many institutions there are in Israel devoted to studying the Arab society and Palestinian society. You will notice then the difference between us and them. We are a torn apart, divided and regressive society in comparison with the Israeli society, which is a modern, dynamic and complex society." If I was Yasser Arafat ... I will ensure that Palestinian Authority (PA) first priority to build, support and finance a Palestinian institution to study/research the Israeli society manipulated by Zionism. Since 1995 Oslo agreement until 28 September 2000, Israeli/Zionist major propaganda war was about Palestinian leadership mismanagement and corruption. Once the Palestinian Intifada started, 28 September 2000, Israeli/Zionist propaganda war was Palestinian violence. After September 11, 2000, Israeli/Zionist main propaganda war was Palestinian terrorism. Zionist State of Israel aiming from these propaganda war to lead to civil war between Palestinians. The seeds of civil war doesn't exists within Palestinian society, it exists within Israeli Zionist manipulated society. Sharon public relation plan to relocate all "problematic" settlements in Gaza Strip angered Settlers' groups and senior politicians who came out immediately against the plan, which would affect about 7,500 Jews in 17 Gaza settlements. Didn't extreme settlers killed former Israeli PM Rabin because he said that he will exchange land for peace with Palestinians! I am sure that you still remember Self-Hating and/or Israel-Threatening List by extremist Zionist http://masada2000.org/abc-list.html. If I was Yasser Arafat ... I will build Palestinian civil society based on democratic institutions and rule of law. I will open public debate about Palestinian military struggle, stop suicide bombers and limit Palestinian military struggle within the Palestinian occupied territories. One of the main reasons that Zionist State want to end the Intifada is to protect Israel's image around the world and most importantly amongst the world Jewry. After September 11, Palestinians organizations needs to think seriously about the any military operation inside Israel or that targeting Israeli civilians. Simply because September 11 events changed the world. United States will not be able to invade and occupy Iraq if there is no September 11. If I was Yasser Arafat ... I will build memorial for late Alijah Gordon who had spent the best part of her life not only campaigning for the Palestinian cause but building real INSTITUTIONS that supports most forgotten people on the earth, Palestinian refugees in Lebanon. Gordon, an American by birth, was trustee of a Malaysia-led Palestinian trust fund set up in 1988 to improve the lives of Palestinians, in particular children. 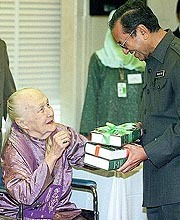 She later headed the Malaysian Sociological Research Institute (MSRI) . Born Shirley Doris Gordon, she was a scholar, historian and socio-political activist who was never far from controversy because of her strong opinions against social injustice. If I was Yasser Arafat ... I will build and name Palestinian institutions in the name of those who devoted their life working and campaigning for Palestinian long history of suffering like late Alijah Gordon. To remind Palestinians who forgotten their own people in the camps. To encourage Palestinian Diaspora to donate from their time and money and campaign for their own people. To remind Muslim and Arab world that they didn't do enough for Palestinians. To remind Christian world that the Holocaust is not their crime, but their shocking silence and if they don't speak the truth now, its a crime. To encourage Jews around the world to speak out the truth against Israel's crime in their name and "Stop talking about the Holocaust. Stop talking about what people owe us. Stop all that rhetoric about Jews being special. I challenge my own community. If we want helicopter gunships to define us as a people, say it, but dont pretend that helicopter gunships are not defining us." (American-Jewish Professor Marc Ellis at Religion Report ABC Radio National 1/8/2000). God knows how many people like late Alijah Gordon. I personally, knew many of them. If I was Yasser Arafat ... I will appoint person like Hanan Ashrawi to manage a Palestinian institution related to Palestinian Diaspora. To empower the Palestinian Diaspora communities and strong ties with Palestine. This will help Palestinian under occupation and Diaspora around the world to build an international public relation campaign. Then Palestinians when they die they will die with peace and not say what late Edward Said said before his death. "In his last days my father wept openly for Palestine and his loss of articulacy and energy to write and write and write. He encouraged me, from his bed, to "continue the struggle, continue...get over your petty personal differences with your colleagues and write and perform and continue, continue unceasingly. Its in your hands" this was meant for our entire generation and it is important for me to convey this to you because I certainly cant shoulder the burden myself. I am amazed that this is coming out so articulately, as I am weeping as I write. If I was Yasser Arafat ... I will appoint a Jewish person, anti-Zionist, to manage and run a Jewish-Palestinian institution to fight Zionism racism. And communicate with the world Jewry. If I was Yasser Arafat ... I will strongly support institutions like Deir Yassin Remembered www.deiryassin.org and help in building memorials for DYR in Palestine and around the world. Fifty years after the liberation of the death camps - in fact highlighted at this time - in memorials, museums, restitution, apologies, and confessions are still being made for and to the Jewish people. Could it be that on the fiftieth anniversary of Deir Yassin, similar memorials, museums, restitution, apologies, and confessions will likewise be made at Deir Yassin and in Jerusalem by Jews, including leaders of the Israeli state, to a Palestinian people en route to their belated and necessary empowerment? Memorialization without justice is, of course, an empty symbol that may compound the injury. These memorials and museums will encourage every Palestinian to write their own history of long suffering and persecution and publish there testimonies in books. Late Alijah Gordon edited book about Palestinian refugees in Lebanon titled 'Palestinians Speak: I Painted the Snow Black ... because we're afraid of the days'. How many books or testimonies in English collected/written/edited by Palestinian writers or institutions other than the work done by BADIL www.badil.org? That will help and encourage the free nations to speak out the truth and most importantly put an end to pro-Israel intimidation and deliberate continuous attack on freedom of speech. Then people will not be intimidated like Professor Stuart Rees, who said that "I've never given way to bullying. Public life is too much characterized by cowardice. If we give way I'd be so ashamed I couldn't face myself. The image of the Peace Foundation would be shameful. Our reputation would count for nothing"
If I was Yasser Arafat ... and did that that will accelerate the defeat of Zionism ideology. Then people in Israel/Palestine (Jews, Christians and Muslims) will share the land forever. That will lead to a One State Solution for all and free of any racism. That will lead to a better understanding between all religions. P.S. The writer strongly supports Yasser Arafat leadership and he never criticized his leadership and talked about corruption, mismanagement and human rights violations because he was monitoring and researching Israel Zionist State and Zionism before late Edward Said made his strong and accurate observation that "that there is no single institution in Palestine that is dedicated to studying Israeli society." The writer strongly believe that the Israeli barbaric Military occupation is the main reason for the so-called Palestinian corruption and human rights violations and most importantly occupation = terrorism. The writer has made various public submissions about Israel, Zionism, Israel-Palestine issue, and freedom of speech. The writer known late Alijah Gordon very well since 2001. Since then Late Gordon gave the writer moral support for most of the issues he raised. 4. First supportive email and letter from late Alijah Gordon. She will be remembered by Palestinian refugees in Lebanon for ever. We received a copy of your e-mail addressed to Peter Nugent, MP, Chair of the Human Rights Sub-Committee, Parliament House, Canberra. Please urgently give us the details on Mohammed Dawood and we will appeal/protest via the Australian High Commission here. We need to know his age, from where he has come and why he attempted to enter Australia, apparently illegally. Of course, all Palestinians suffer, but unless hes a survivor of torture or other clear abuse, I wouldnt have much hope. At least half or more of the Palestinians in Lebanon are registered with UNRWA, but that does not constitute grounds for fleeing to another country. We were also appalled to learn that Australia has offered 200 places to Lebanese "Lahad" families, if indeed they were linked with the South Lebanese Army. Are they coming direct from Lebanon or from Israel? We will also raise this point with the Australians. Kindly give our salaams to Brother Ali Kazak. If his publication still exists, we would welcome receiving copies. because were afraid of the days  being a testimony from one of the women who was abused in that infamous prison. When the Israelis unilaterally withdrew from the area they had illegally occupied since the early 1980s, those SLA families that fled with them to Israel were in fear of retribution from the Lebanese masses. If their hands had been clean, they neednt have feared; there has been no retribution taken against such persons by the Lebanese villagers or even by Hizbullah. However, there is a legal process being carried out by the Lebanese Government to prosecute war criminals and collaborators. Might that not be the reason they fled? Were appalled that Australia would offer a haven to those families; properly, they should remain in Israel, the country to which they gave their loyalty rather than to their own country, Lebanon. At the same time that this decision has been taken by your government (see The Age of Wednesday, 04 April) Mohammed Dawood, a Palestinian refugee registered with UNRWA, has been detained in a room with no window at Maribyrnong, one of your detention centres, for the past six months. Apparently, in desperation, he had attempted suicide. In response, according to a letter from one of your citizens published in The Age, he had his hands and feet bound for 48 hours, and his legs still bore the scars four days later. What could it possibly benefit Australia to willingly harbour Human Rights abusers and on the other hand, refuse entry to a registered Palestinian refugee? In our era of the multimedia, one cannot hide ones deeds. We would pray for a reversal of Mr. Ruddocks decisions.